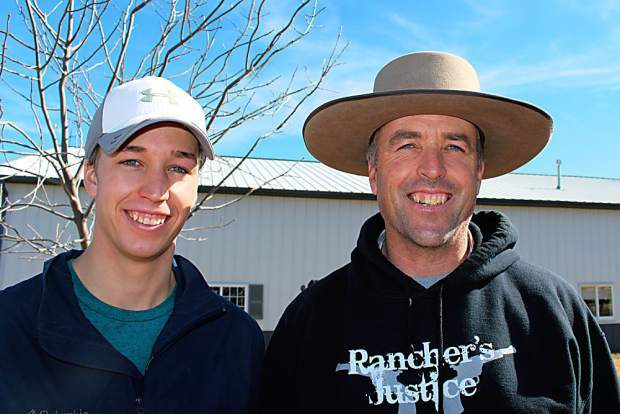 Russell (left) and Brian Quigley of Avon, Mont., purchased the high-selling fall bull. Sam Twedt, Twedt Red Angus, of McHenry, N.D., purchased the top-selling heifer. 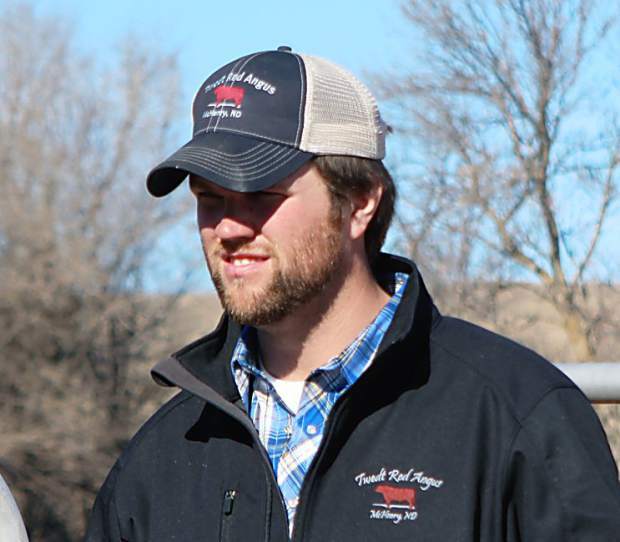 Jason Otto, Otto Red Angus of Glenfield, N.D., purchased the second-high-selling yearling bull. 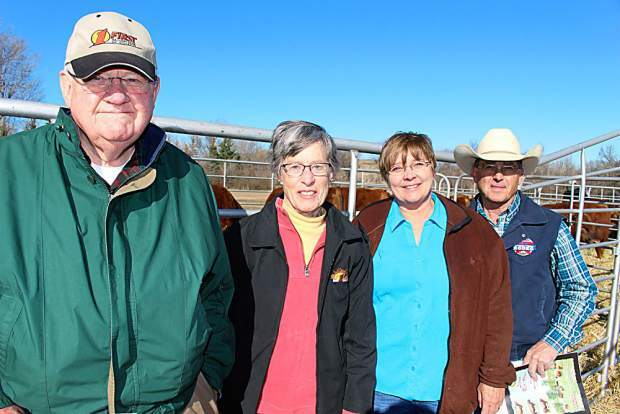 Ray and Cynthia Saunders (left), and Susan and Deb Edwards (right), Saunders Land & Livestock of Gillette, Wyo., purchased four top-selling bulls. Location: At the ranch near Sidney, Mont. 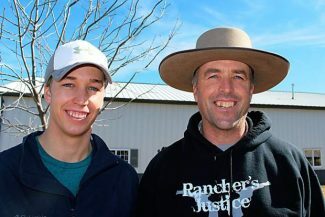 The Leland and Koester families welcomed a huge crowd for their annual production sale held at the ranch near Sidney, Montana on Mar. 13. The weather was great and was very much appreciated by the sale hosts and buyers as well. The Leland family has been in the Red Angus business for nearly 50 years and were heavily involved in bringing the Red Angus breed from near obscurity when they started to one of the most popular and sought after breeds of today. The sale format was a bit of a change from previous years, going to an all video sale. Also, Melvin Leland stepped off the block after his opening comments and turned the reigns over to son Todd to carry on the block duties. Even though there were some changes on sale day, one thing that hasn't changed is the quality of the sale offering. The bulls were big and thick and in great sale condition. They were not overly fed and should go out to cover the rough breeding pastures of the area and come back in this fall without falling apart. The top-selling yearling bull was Lot 4, Leland Excell 223-4565, an April 5, 2014, son of VGW Excell 223. He sold to Crump Land and Livestock of Gillette, Wyo., for $25,000. Otto Red Angus of Grace City, N.D., purchased Lot 3, Leland Right Gun 4414, a March 24, 2014, son of Leland Right Gun 292X, for $21,000. TF Livestock of Gillette, Wyo., purchased Lot 2, Leland Merl 039-4656, an April 11, 2014, son of WFL Magic Merl 039Y, for $20,000. 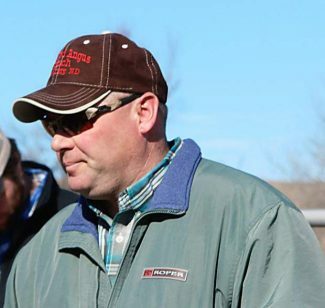 Saunders Land & Livestock of Gillette, Wyo., purchased four top-selling bulls. Lot 7, Leland Excell 223-4548, an April 4, 2014, son of VGW Excell 223, sold for $20,000. Lot 9, Leland Epic 397-4549, an April 4, 2014 son of Beckton Epic R397 K, sold for $18,000. Lot 10, Leland Heavy Metal 361Z-4538, an April 4, 2014, son of Leland Anvil Too 361Z, also sold for $18,000. Lot 5, Leland Long Load 122-4682, an April 15, 2014, son of Leland Long Load 122Z, sold for $17,500. Lazy 77 Ranch of Manning, N.D., purchased Lot 14, Leland Excell 223-4655, an April 11, 2014, son of VGW Excell 223, for $17,000. Crump Land and Livestock of Gillette, Wyo., purchased Lots 18 and 21 for $16,000 each. Lot 18, Leland Excell 223-4563, was an April 5, 2014, son of VGW Excell 223, and Lot 21, Leland Fire Point Y50-4542, was an April 4, 2014, son of Leland Fire Power Y50. Quigley Ranch Co. of Avon, Mont., purchased the top-selling fall bull, Lot 28, Koester Sonofagun 336, an Aug. 30, 2013, son of Leland Right Gun 292X, for $16,500. Jacobson Red Angus of Hitterdal, Minn., purchased Lot 26, Koester Stakeholder 330, an Aug. 27, 2013, son of Brown 3K Stakeholder X7870, for $16,000. Crump Land and Livestock of Gillette, Wyo., purchased Lot 27, Koester Sonofagun 349, a Sept. 5, 2013, son of Leland Right Gun 292X, for $14,000. Twedt Red Angus of McHenry, N.D., purchased the top-selling heifer, Lot 203, Leland Banjo 4715, an April 19, 2014, daughter of Larson Jubilee 155, for $4,250. Hailey Wehri of Newcastle, Wyo., purchased Lot 206, Leland Fire Point Y50-4434, a March 28, 2014, daughter of Leland Fire Power Y50, for $4,000. This was an excellent sale for the Leland and Koester families. An excellent pre-sale lunch was served and those that stayed after enjoyed perfectly prepared prime rib with great hospitality and fellowship.